Jessica Rajko is an interdisciplinary artist exploring the liminal space between somatically informed dance and interaction design. As an assistant professor at Arizona State University, her current work investigates the ethical and corporeal implications of digital technologies and big data from an intersectional feminist lens. Jessica has presented and performed in various collaborative artworks nationally and internationally, including Amsterdam’s OT301, Toronto’s Scotiabank Nuit Blanche festival and New York City’s Gotham Festival at The Joyce Theatre. She was named one of Phoenix New Times’s “100 Creatives of 2016” and has been commissioned by the Currents New Media Festival, Breaking Ground Dance Festival, Mesa Arts Center, Heard Museum, and Phoenix Art Museum. Jessica is a founding co-Director of the ASU Human Security Collaboratory and is affiliated with the Arts, Media and Engineering Synthesis Center as a collaborative researcher/artist. 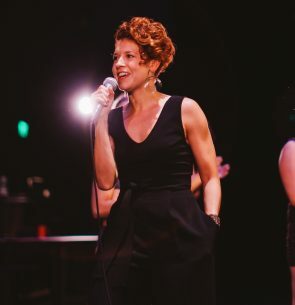 She serves on the steering committee for the PAVE Program in Arts Entrepreneurship and is the mentor for the dance MFA concentration in Interdisciplinary Digital Media and Performance. She is the co-founder and co-director of urbanSTEW (urbanSTEW.org), a non-profit arts collective that creates participatory, art/tech installations to engage local communities in multisensory, felt experiences. Jessica received her MFA in Dance and Interdisciplinary Digital Media at Arizona State University in 2009 (outstanding graduate of the year) and her BA in Dance and Psychology at Hope College in 2005.